It's Time 2 PARTY! 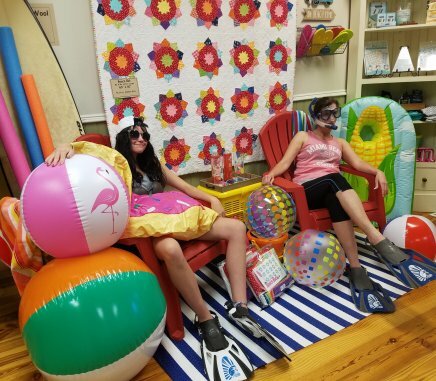 Utah Shop Hop 2018 is going on NOW and you're invited! Let's get this party started! Actually it started on Wednesday but you know it's best to arrive fashionably late to any party. 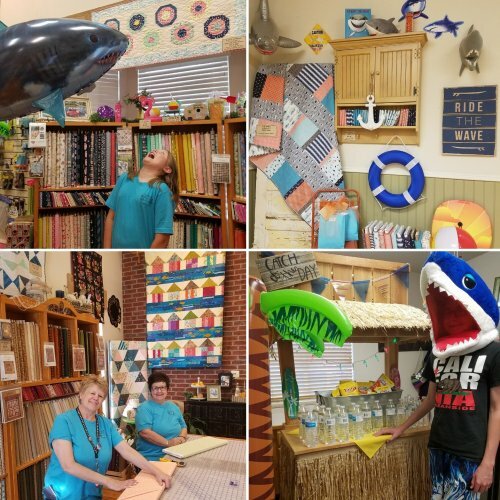 You still have two more days of quilt shop party hopping to get in on. Can you make it to all 14 shops in just two days? ABSOLUTELY! Yesterday one of our party attendees reported that she had traveled 351.2 miles, visiting all 14 shops in 7 hours, 41 minutes. Now that is some serious quilt partying! We look forward to the Utah Shop Hop all year long. No time is wasted choosing the next year's theme then we start watching for just the right fabrics & patterns for new projects. Our exclusive free pattern gets under way. We pull together our creative brains (and scour Pintrest) for games, treats and wacky fun. Shannon watches all year long for just the right display items and our sewing machines whir until the very last minutes of preparation. It's a crazy kind of fun seeing it all come together but one thing was different about this year's planning. We've been missing our MaryAnn! For years she has been the life of our Shop Hop party; kooky costumes, exciting games and more party energy than the rest of us put together. Oh, how we have missed her! You can imagine then how excited we all were when she made a surprise "cameo" entrance at the beach party last night with her cute daughter, Parker - - snorkel, flippers, coconuts and ALL! We hope you'll join us too for the biggest quilt party of the year here at the Corn Wagon Beach Party! Visit utahshophop.com for all the details including a map of participating shops. The sunny Beach Ball quilt you see here (behind these two beach party characters) was pieced by Shannon White and designed by Me & My Sister's Designs using their Double Wide Dresden Ruler. You can watch their demo here and see how fun these beach balls really are to make! We have kits, rulers, patterns and books here at the shop. I think Shannon deserves a round of applause for her darling displays (I mean look at that corn floaty)! She always turns the shop into something special for the Shop Hop. Marianne Michaels put a fabulously bold, beach-inspired twist on this traditional pattern by Norma Whaley of Timeles Traditions. 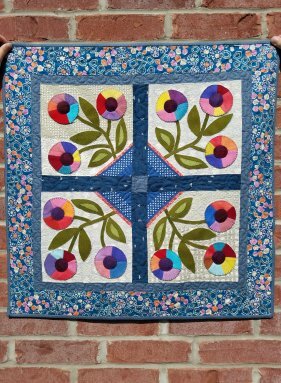 Flowers Outside My Window is a 30" x 30" table topper or wall hanging. Marianne chose beautiful hand-dyed wool for the bright blooms then brought it all together with some fresh Cotton + Steel blues. Kits and patterns available! We should give you fair warning... we have had a few shark sightings here at the beach party. But I dare say the fabulous quilts on display make a visit to the Corn Wagon beach well worth the risk! The "fish 'n' chips" at our snack shack are sure to lure you in! The quilts you see here are all available as kits and include (clockwise from top, left) our Shop Hop table runner, Life's a Beach, designed by Emily Herrick; Shark Attack (AKA 5 & Dime by, All Washed Up); Summertime Sampler by, Erica Kaprow; Where Surf Meets Sand (AKA Equilateral by, Art Gallery Fabrics) and Hale Makai by, Craft Sisters. Kits available! June 4th - 25% off WOOL! This sale includes wool by the yard, wool by the bundle, wool by the ounce and select wool kits! Does not include wool block-of-the-month kits. Thurs, June 14th 6 p.m. - 9 p.m. This roomy tote is ready for all your summer adventures! Load up everything you need for a day at the beach (holds up to 4 towels!) and never lose your keys in the sand thanks to a handy key clip! Pocket options and fun accents allow you to show off some of your favorite fabrics. Finished Dimensions: 7.5” D x 14.5” W across base, 14.5” tall, 23.5” including handle. Instructor: Mary Jacobsen. Skill Level: confident beginner.